Home › Starpack Xl Silicone Kitchen Utensils Set (6 Pc) In Hygienic Solid Coating + ..
Starpack Xl Silicone Kitchen Utensils Set (6 Pc) In Hygienic Solid Coating + .. Size: XL Size 13.5" (6 Piece Set) - NEW! EXTRA LARGE & EXTRA LONG 13.5" = 30% BIGGER THAN OTHER SILICONE UTENSILS - Our customers told us size DOES matter, and we listened! These premium, heavy duty tools are exclusive to StarPack (patent pending), and are designed to take your cooking to the next level. Larger heads, deeper bowls, and longer handles mean greater control in the kitchen. BEAUTIFUL, COMPLETE 6 PIECE SET FOR HOME COOKS: This attractive set combines all your essential kitchen utensils - a Turner Spatula, Spoonula, Pasta Fork, Serving/Mixing Spoon, Slotted Spoon, and Ladle. All available in 3 vibrant colors to match your kitchen decor. HYGIENIC SOLID SILICONE DESIGN FOR EASE OF USE & CLEAN UP: There are no seams between the handles and heads for bacteria to grow, which means healthier cooking and less clean up required. With a steel core, ergonomically designed handles and the perfectly shaped heads, these are a pleasure to use. And StarPack's premium non-stick silicone is literally the easiest substance to clean. Simply wipe under hot water or throw them in the dishwasher. 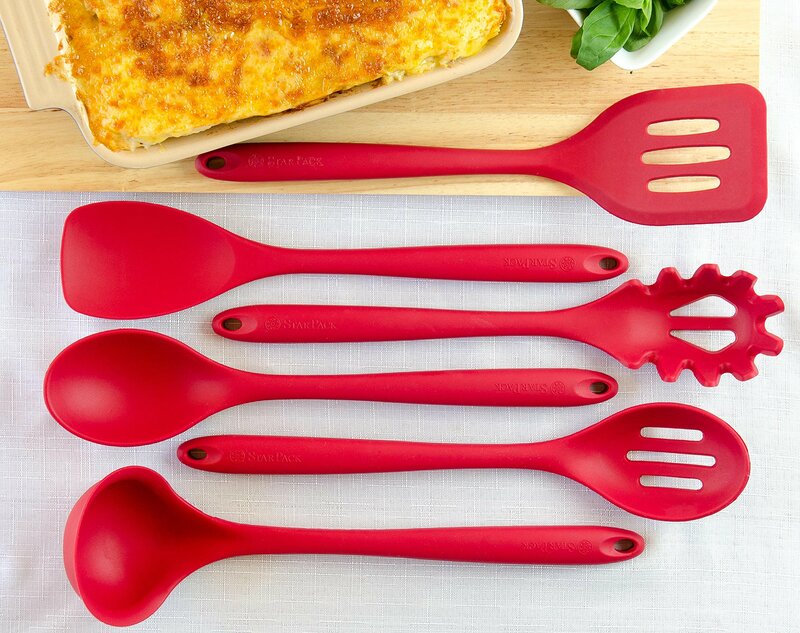 QUALITY YOU CAN COUNT ON: StarPack's silicone cooking utensils are 100% FDA Grade and BPA Free. These heat resistant cooking tools can be used up to 480F and are non-stick friendly so you can mix and stir directly in your expensive pans. And they're stain and odor resistant so you'll enjoy them for years to come - they simply won't discolor, warp, melt or chip like your old plastic kitchen utensils or bamboo kitchen utensils. Size: XL Size 13.5" (6 Piece Set) - NEW! | Color: Cherry Red Ultimate XL 6 Piece Silicone Kitchen Utensils Set! Consists of: 1 x XLSpatula/Turner: 13.5" x 3.15" 1 x XL Spoonula: 13.5" x 2.75" 1 x XLServing/Mixing Spoon: 13.5" x 2.75" 1 x XL Slotted Spoon: 13.5" x 2.75" 1x XL Ladle: 13.5" x 3.75" (holds 4.5 oz) 1 x XL Pasta Fork: 13.5" x 2.75" Hygienic: Solid silicone surface on these kitchen utensils means no crevicesfor bacteria to grow 100% FDA Grade, BPA Free Silicone coated cookingutensil set Heat-resistant utensils up to 480F Stain and odor resistant Non-stick cooking utensils: Won't scratch pots and pans Perfectly shapedheads: perfect for all those hard to reach places Ergonomically designedsilicone coated steel cores Dishwasher safe kitchen tools --- Get yours nowby clicking the orange ADD TO CART button and enjoy the easy-tasty-healthybenefits of cooking with silicone today!